Thank you for your letter of December fourteenth. It is very amusing to get such word of Proctor of Cincinnati. I think you can rest assured that he can do me no harm. It was he who gave the money to support West against me in the matter of the Graduate College controversy in Princeton. He will do all the mischief he can now, as he did then. But I think his motives will be only too evident, and it is not money the other side needs: - they have plenty-but brains and opportunity. 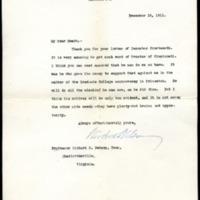 Wilson, Woodrow, 1856-1924, “Woodrow Wilson to Richard Heath Dabney,” 1911 December 18, WWP20456, University of Virginia Woodrow Wilson Letters, Woodrow Wilson Presidential Library & Museum, Staunton, Virginia.